Julie Davidson is very proud to have been part of the Jay County Fiber Arts Festival from the very start and would like to thank Gyneth Augsburger for getting it started and keeping it going. Julie enjoys the process of making yarn, starting with her flock of sheep and Angora goats. 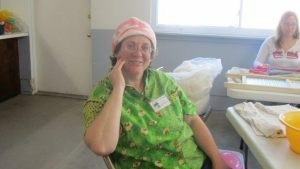 She teaches spinning, dyeing, and felting around Northeast Indiana, and demonstrates fiber arts at reenactment festivals each fall. She and her husband regularly host spin-ins at their farm, Teasel Hill Angoras, in Columbia City, Indiana. Click here to see which classes she will be teaching this year!